[Chris] has been going about his business, letting his interest guide him as it will. But always in the back of his mind is his Androcade project, and he’s spent the last year making improvements. 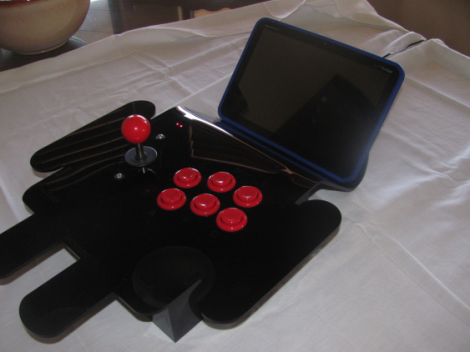 It’s an arcade controller for playing games on an Android tablet. It connects to the device via Bluetooth, and includes a built-in stand. His original version was featured here last year. It was made from wood (with a nice Android green finish) and included three buttons and a joystick. This time around he moved to some black laser-cut acrylic for the case, and has doubled up on the buttons. It also now enumerates as an HID Bluetooth device, whereas before it was pushing serial data over the BT connection. He’s had enough interest from his friends to also create an iPad version all in white. It connects and works just the same as the Android flavor. Check out a bit of Donkey Kong gameplay after the break. Hell that controller looks better than a lot of CRAP (China Region Android Pads) I’ve seen! His next project should be building a stand up MAME cabinet, some plywood and a cheap monitor with an HDMI hook up should do it.